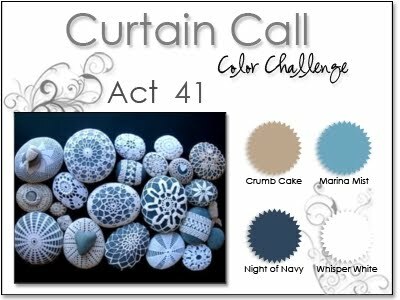 I had to substitute for the Marina Mist, because I don’t have that color yet…I used a similar blue for my card base. 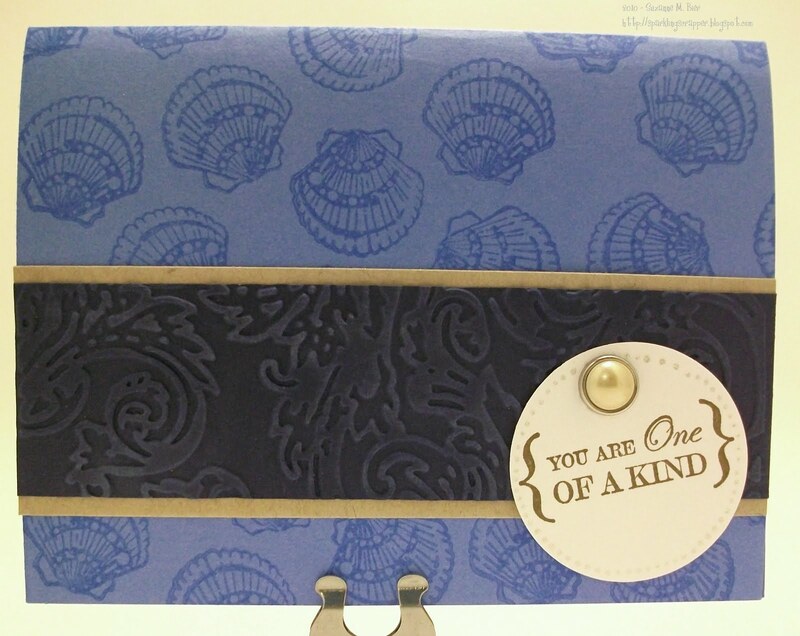 The shell background was stamped with VersaMark watermark ink using an Inkadinkado clear stamp. I embossed a strip of Night of Navy cardstock with a Tim Holtz folder in my Big Shot. Then, I accented the embossing with a white cat’s eye ink pad. I glued the embossed section onto a strip of kraft cardstock. The sentiment is from Stampin’ Up’s “One of a Kind” set, and it’s stamped in Soft Suede ink. I punched the sentiment out with an SU circle punch, accented it with a Stardust pen, and attached a pearl brad by American Crafts to complete the card. Thanks for looking at my card! To see the design team’s creations and to check out the other fabulous cards entered in this week’s challenge, visit Stacey’s Stamping Stage! Great use of this week's colours. Thanks for playing the Curtain Call.